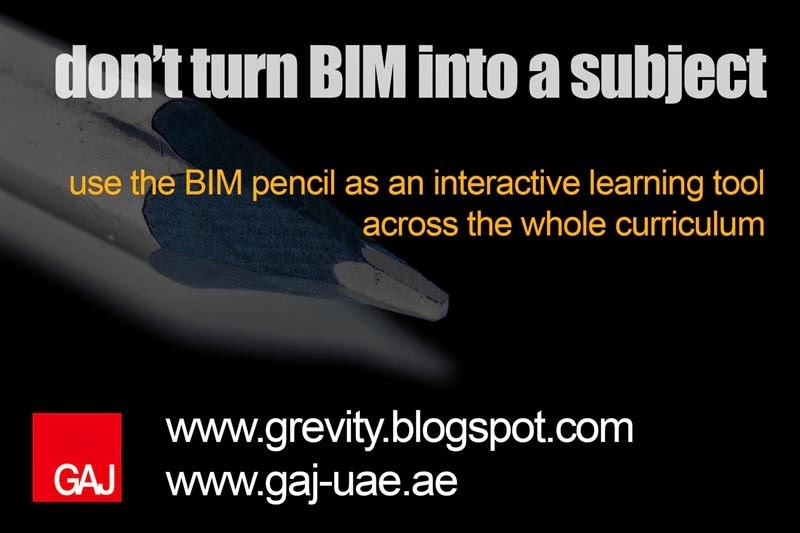 This is a talk I gave in February at the 4th Dubai BIM Breakfast. 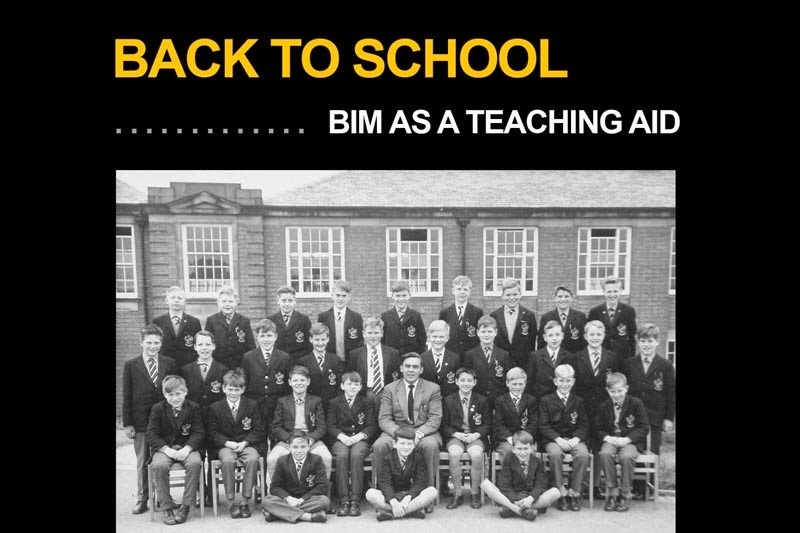 It's a subject very close to my heart: education, and the active role that BIM should be playing in teaching and learning processes for all students of architecture, engineering, quantity surveying, construction management etc. You have to pretend that I'm talking. Here we go with the opening slide. Those who have seen me speak before may have noticed that I am significantly smaller than last time you saw me. At the first BIM breakfast I invented the term "BIM addict" to convey my passion for all things BIM. It was a light-hearted metaphor, but by then I had already realised that I had a more serious addiction, one that has become very common in the "developed world" I have a psychological addiction to food. This was my last ever serious session of substance abuse. An "all you can eat" brunch. What is that ? These things ought to come with a health warning. This is a representative cross-section of BIM users from GAJ, gathered to celebrate my 10 years with the firm. 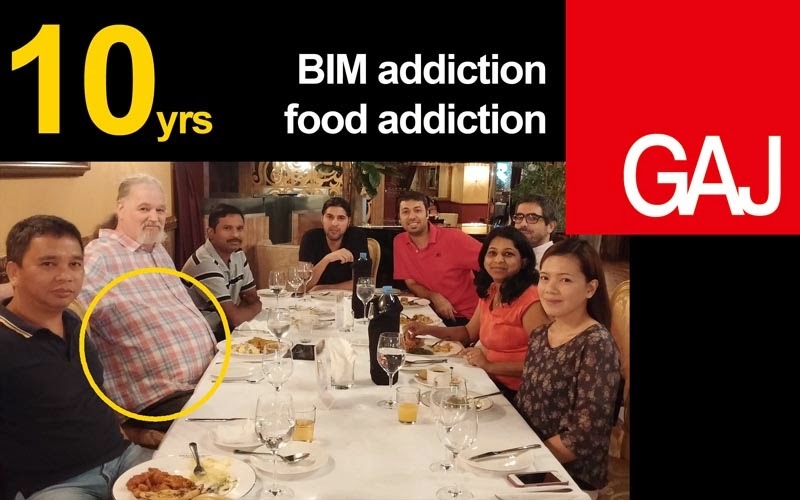 A bit late, I'm about to reach 11, and it's almost 10 years now since we started our BIM journey. I mentioned the "developed world" but perhaps we should call it the "overdeveloped world". I think there's an interesting parallel here between personal addiction to food and global addiction to fossil fuels. 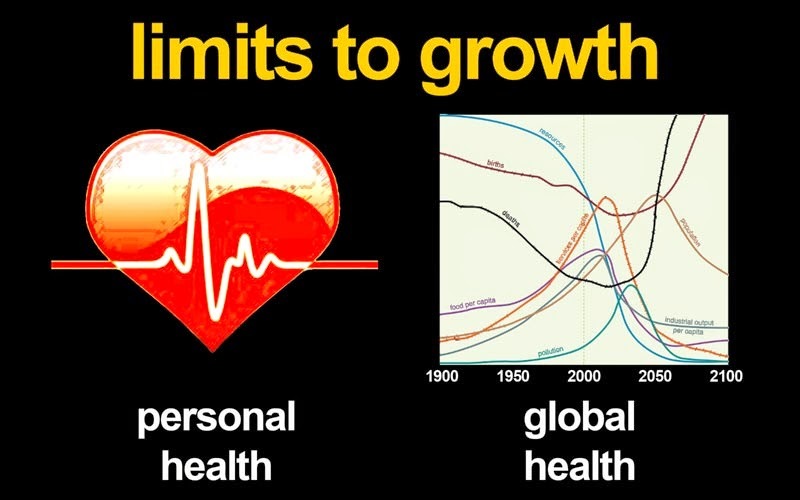 For sugar levels, bad chloresterol and hyperglycemia; read pollution levels, global warming and hyper inflation. I have managed to turn my body clock back 10 years in the last 4 or 5 months, but I'm afraid it will be much harder for us to untangle the global issues. 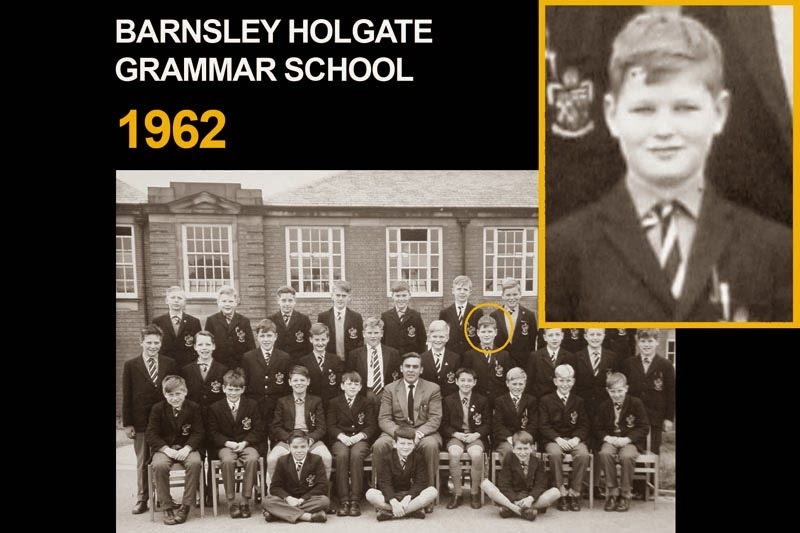 Turning back the clock a bit further, I went to an old fashioned English grammar school and 50 years ago I was a quiet, studious boy ... But truth be told I much preferred subjects like Maths & Physics to say History & Geography. Memorising facts bored me. I liked the challenge of understanding principles and trying to apply them to novel situations. But best of all I liked Art, a subject where you had a blank sheet on which to create your own version of reality. 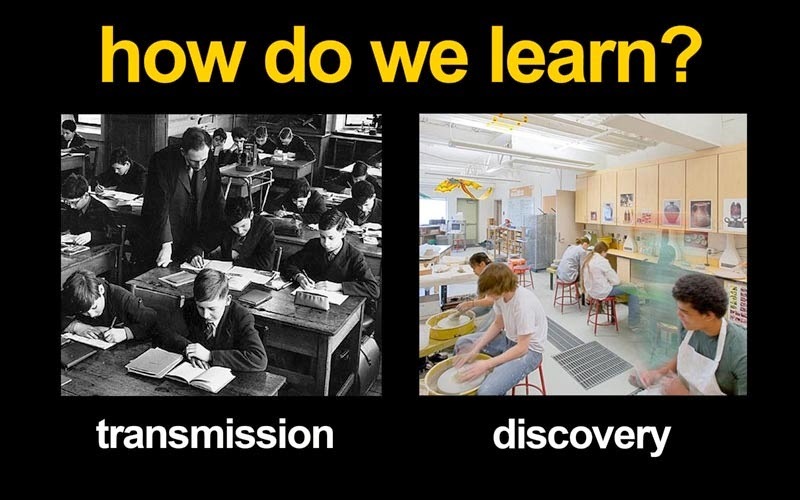 I especially liked learning by discovery, self-directed learning, active learning (as opposed to the old "transmission" model where the students are passive recipients of knowledge) But there was one occasion when History came to life for me as a subject. For some reason, our teacher ("Spot" Avery) decided to throw us the challenge of representing social processes in diagrammatic form. Actually this diagram is a model, in the sense of a mathematical or scientific model. It's an attempt to isolate the critical aspects of a real life phenomenon and represent them in a way that deepens our understanding. Thats what BIM models should be. Simplified representations that allow us to solve problems and make decisions. I was good at Art and Maths so I decided to become an architect. Left behind the coal-mining town I grew up in and headed for "swinging London". And of course I was easy pickings for the spirit of youthful rebellion that filled the air in the late 60s and early 70s. The diagram here is my take on education systems at the time. A square box designed to turn diverse individuals into compliant little boxes ready for deployment in factories and offices. Architecture schools are interesting places. You are supposed to spend about half your time on taught courses (transmission) and half on "Design Studio" (discovery) By second year I just stopped going to the lecture courses and spent all my time "discovering". 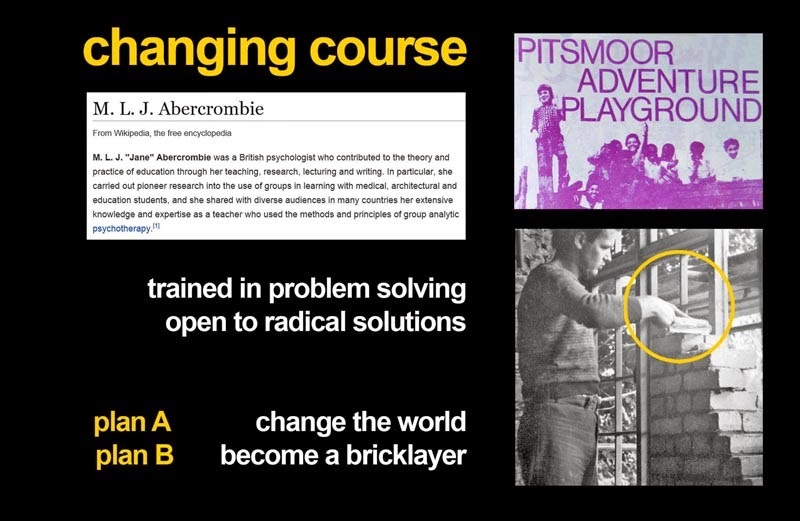 There was an interesting woman based at the Bartlett in those days, a psychologist called Jane Abercrombie. You can find her in Wikipedia, but it doesn't mention the aspect of her work that is most relevant here. She discovered that architecture students were remarkably adept at switching careers. Compared to people who study medicine or education, they are much more likely to end up doing something completely different than what they were "trained for". That's exactly what many of us did. We wanted to change the world. We had been taught to analyse and solve problems. So we went out looking for problems. 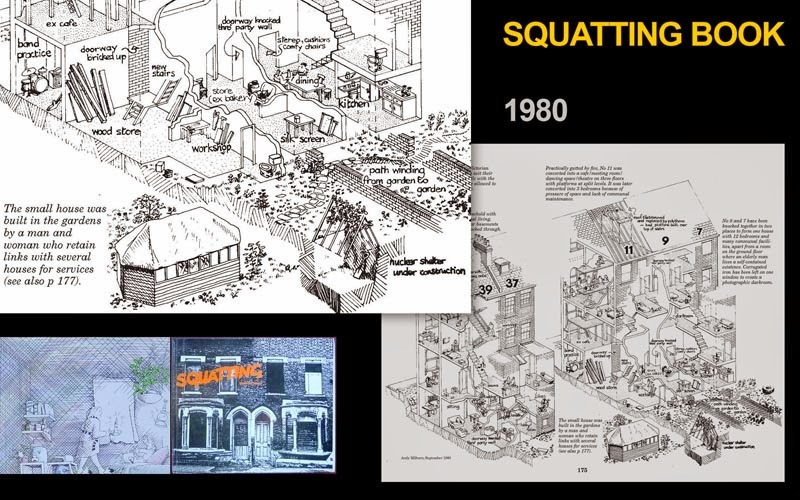 I took an interest in adventure playgrounds and drew cartoons for various fringe publications and I got tangled up in a building cooperative. Suddenly the subjects I had found so boring in lecture halls started to get interesting. Construction technology, theory of structures, environmental science all came to life in the activity and challenge of real building work. 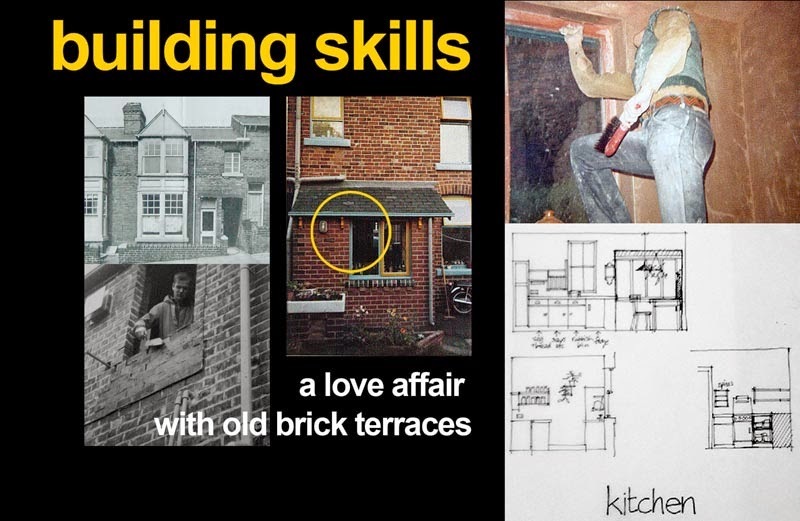 So I spent most of my 20s learning to lay bricks, plastering, making wooden window frames, becoming fascinated by the way the old brick terraces of northern England had been constructed at the height of the industrial revolution. I was still drawing, thinking in visual terms, but this became integrated with the practicalities of getting stuff done. 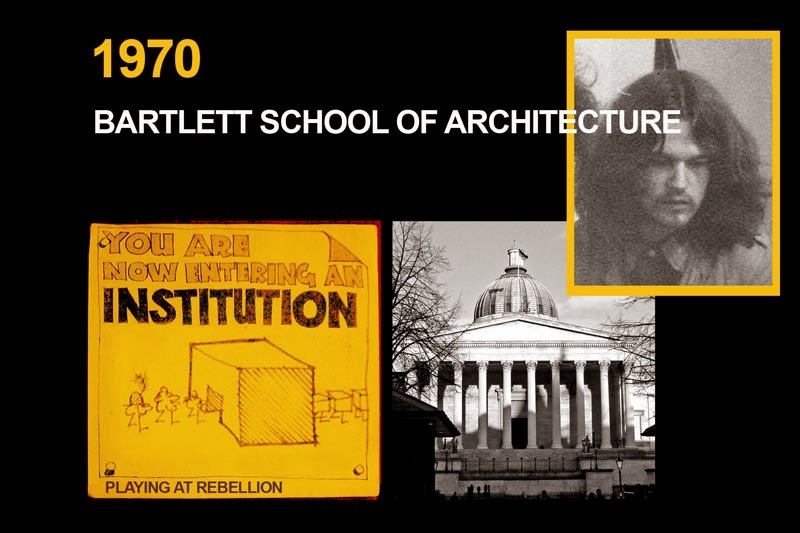 At the end of that period I was invited by some friends from my London days to illustrate a book about the squatting movement of the late sixties and early seventies. 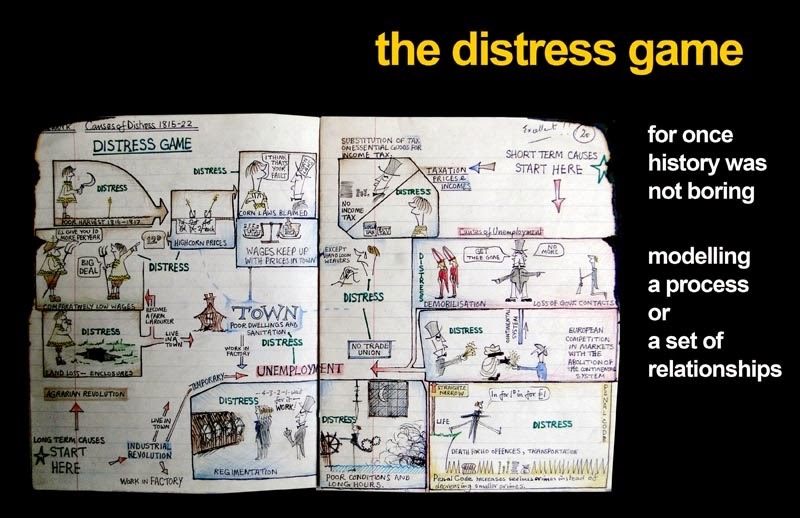 This drawing is another model, a representation of a social process where a group of people took over a row of terraced houses and converted them into some kind of living, breathing experiment in communal living: knocking holes through walls, inserting new uses into spaces, arguing, negotiating, learning. Then another sudden change. 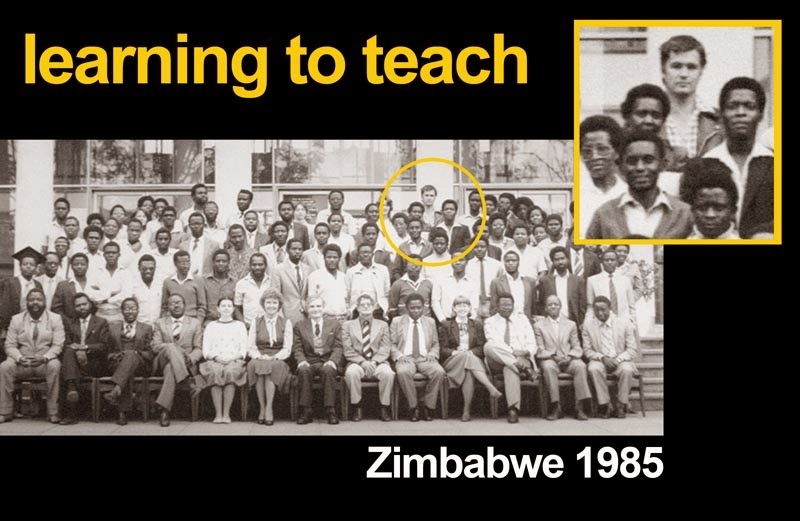 I went to Zimbabwe to teach building at an experimental school and ended up staying there and spending my 30s working in education. 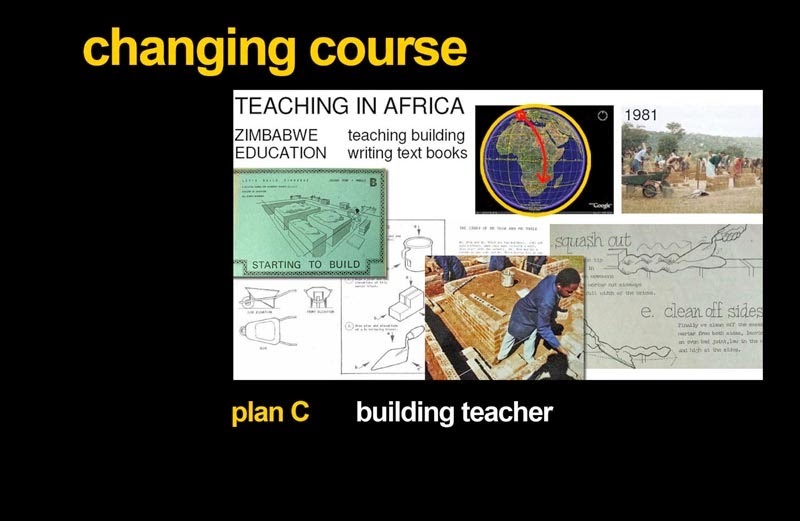 I taught building, wrote text books, trained teachers. It was a very exciting period for me, pulling together my drawing abilities, my building skills, my interest in new approaches to education. While working in the Curriculum Development Unit I took a part time course to train as a teacher. The university couldn't handle the idea of a building teacher at the time, so I registered as a maths and science teacher. 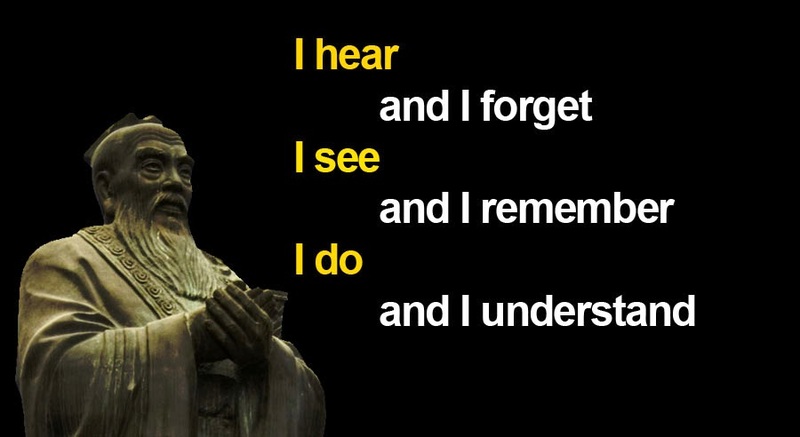 One of the things that came up early on was this saying which is attributed to Confucius. Of course this served to reinforce my own ideas about active learning, group work, and problem solving. One of our maths education assignments called for us to make a teaching aid that encouraged problem-solving abilities. I chose orthographic projection, which just about makes it into the maths curriculum as part of geometry. My teaching aid was made from matchboxes which I stuck together in groups of 3 and painted white. This gave me a set of shapes which students could handle, discuss and draw. There was a set of worksheets to accompany these shapes, designed to gradually draw them into the process of drawing elevations and plans in true orthographic. 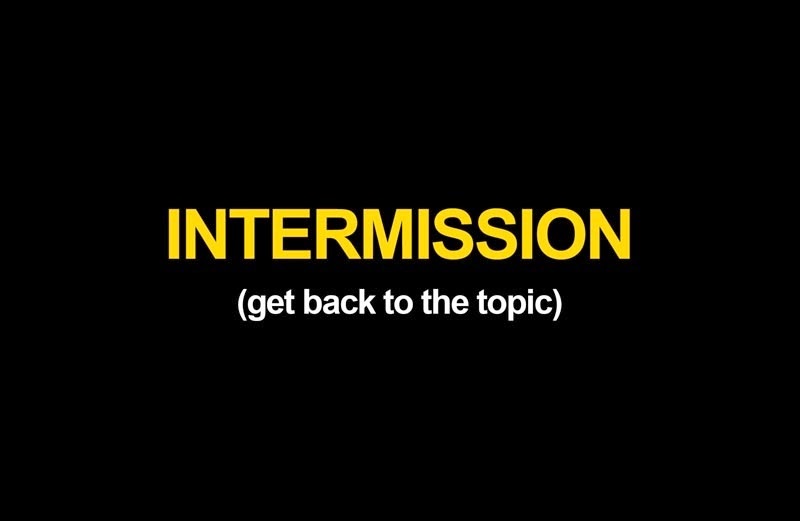 We're not actually going to have an intermission yet. This is just a reminder to me to get back to the topic before my time runs out. 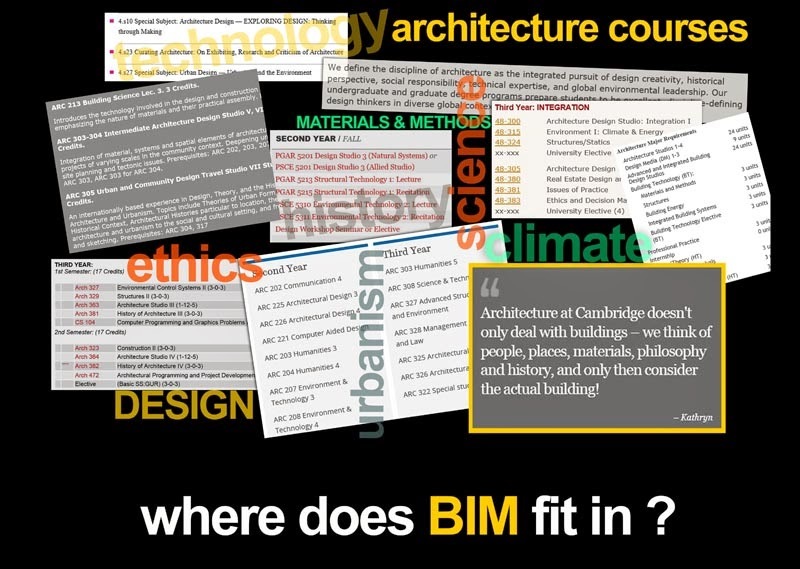 How are we going to fit BIM into the curriculum ? I will focus on architecture courses, but the principle applies to building management, engineering, quantity surveying etc etc. It's a packed schedule so fitting in another course on BIM is going to be hard. But I think that's a bad idea anyway. 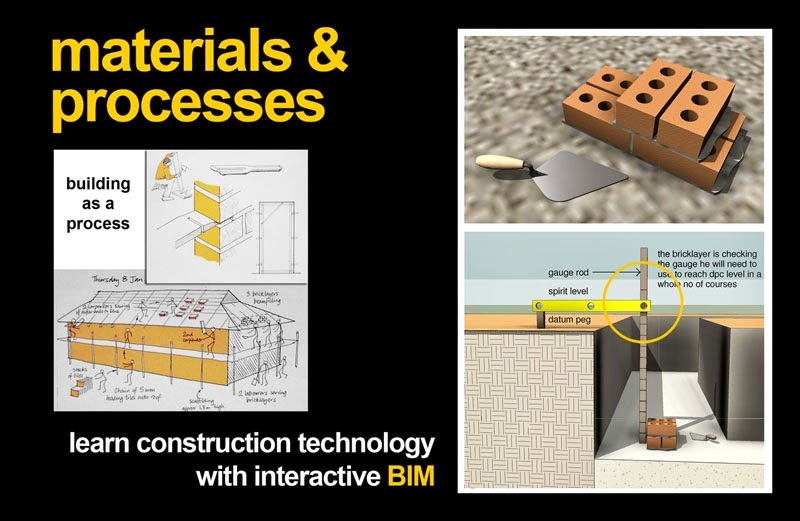 BIM shouldn't be a taught course, it should be a thinking tool to be used everywhere. 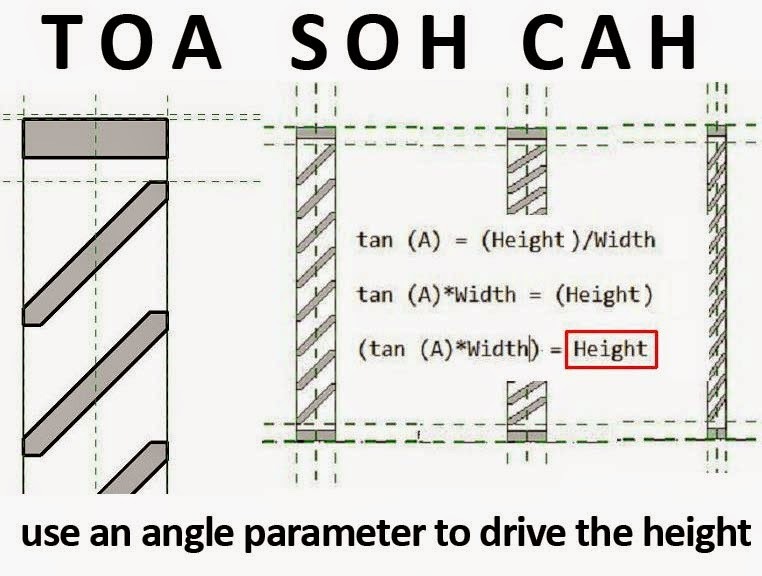 Take out your BIM pencils and get to work on this problem. 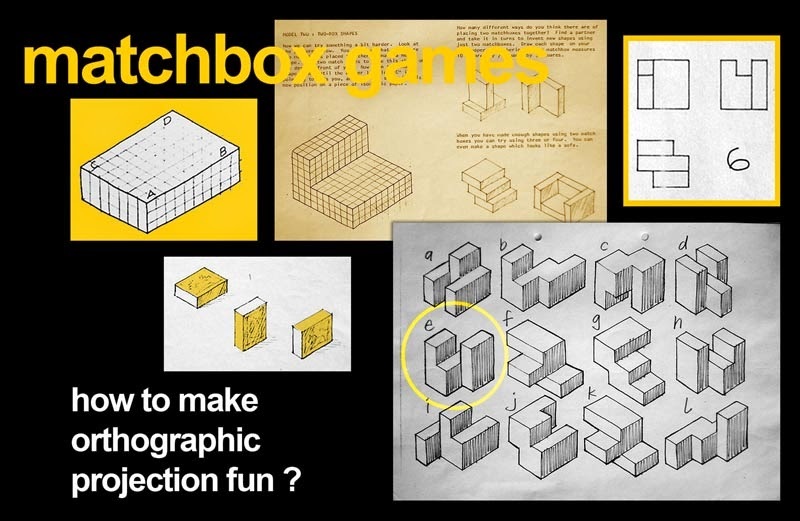 Just for fun I decided to convert my matchbox exercise into BIM. I see this as a supplement to the original concept, not a replacement. Students would still have the physical models and they would still be challenged to draw shapes on graph paper as solutions to puzzles. But they would also be able to access the shapes on computer screens or tables or mobile phones even. So what does BIM add. First of all it makes the teacher's life much easier. Typically with BIM there is a bit more effort involved in setting up the first 2 or 3 views. After that your productivity starts to catch up with hand drawing and ultimately you can generate new sheets in a fraction of a time that hand drafting or CAD could manage. The other interesting point is that if you click or tap on an individual matchbox, it highlights in all the relevant views. This is a really useful visual cue for students who are struggling to make sense of orthographic and isometric projects. 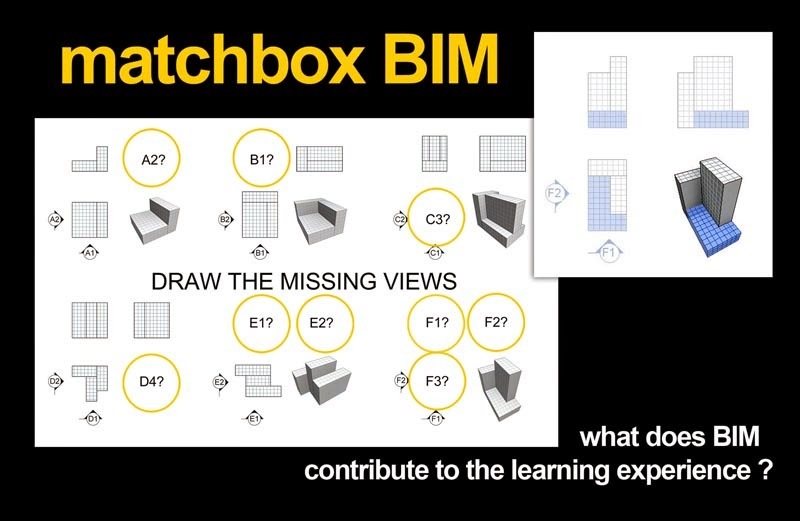 So let's look at BIM as a hands on teaching aid in the context of typical Architecture courses. There is a myth that authoring tools like Revit are "no good for design". Well it all depends how you use them. If you treat Revit like a 4H pencil slavishly running along a straightedge, then your design work might be a bit stilted, but if you think in terms of 6B and freehand sketching you might just find that Revit has some useful features for exploring sculptural form. It's all about fluidity, following ideas wherever they may lead. By the way that's a genuine mistake in the image above. Should be Oscar, not Felix, but they were both pretty fluid when it came to form finding, and they both used strong geometric generators to drive their ideas forward. Which brings me to the courses that explore the ideas behind the designs. "Form Follows Function" , "Less is More" all that kind of stuff. 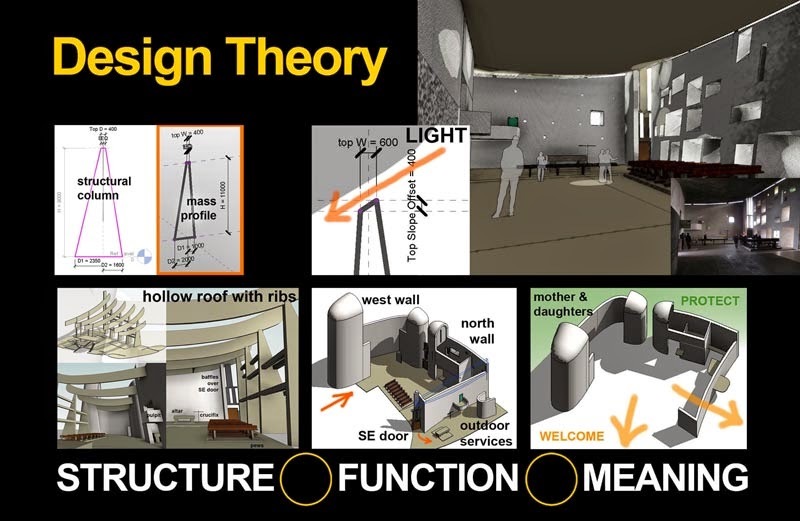 Le Corbusier was a great one for elaborating the theoretical underpinnings of his work, and if you want to get beneath the skin of a building like his chapel at Ronchamp, there is no better way than modelling it using BIM. It's a fascinating building on many levels, well suited for a design theory course. The hand drawings were created for Bachelor of Education course for Building Teachers that I designed and operated for two years before changing direction again and returning to architecure. On the right are my BIM versions of the same kid of thing: visual aids to help people learn about building materials and processes. 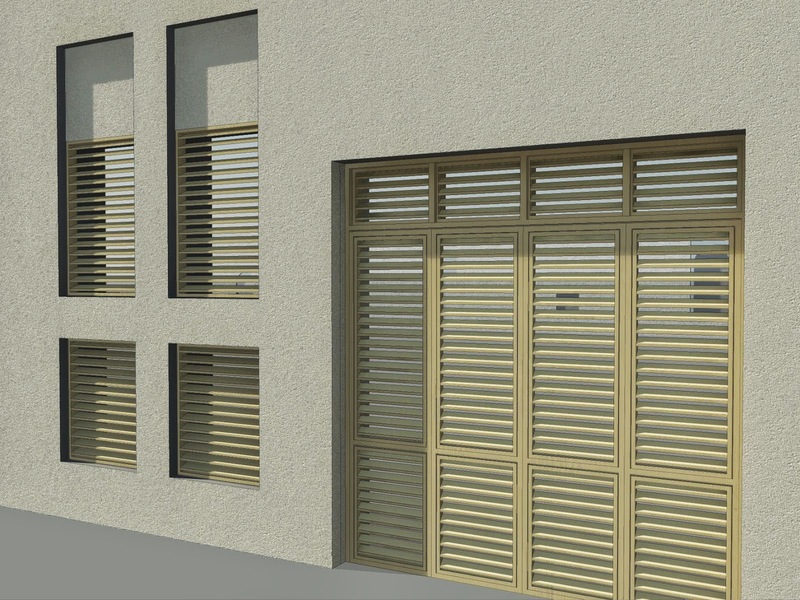 Some of these can be made by the teacher, but then I would challenge the students themselves to go out and observe building processes, sketch what they see and model some aspect of this using BIM software. It's called learning by discovery. I've shown this slide before. I harks back to my love affair with the old brick terraces. We don't aim to fill students heads with facts about how buildings are constructed today. Rather we want them to understand why and how buildings have been built at different times and in different places. That we they will have the skills to adapt to a changing industry, or a world facing a serious resource and endergy crisis. 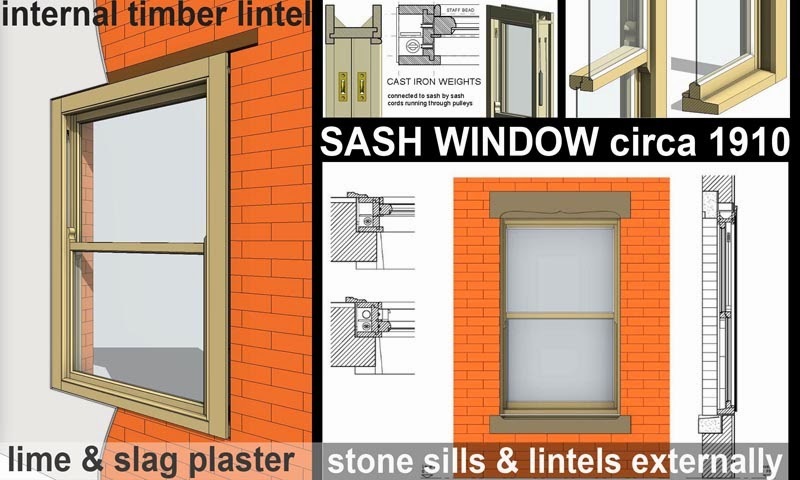 What was good about timber sash windows ? Why were they such a successful technology for two centuries and why did they so suddenly go out of fashion ? I've shown this before as well. 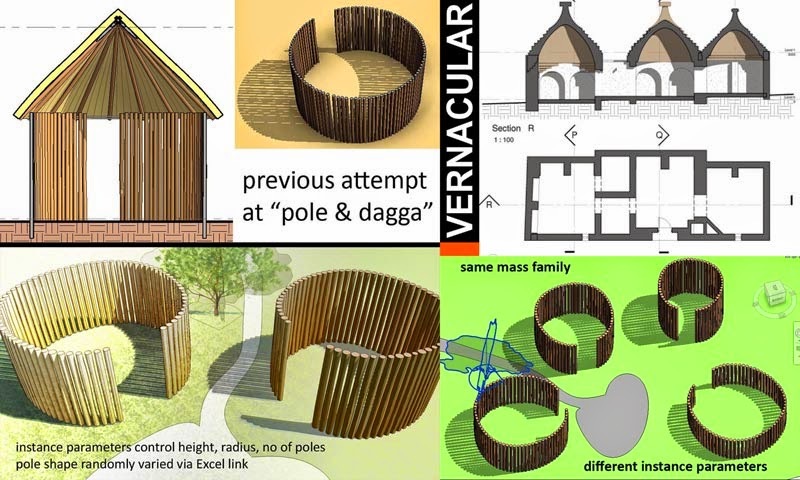 Vernacular housing is always a fascinating subject for students to grapple with. Is it sad to see rich and complex ways of life disappearing before our eyes ? Why to people abandon thermally appropriate roofing technologies and substitute corrugated iron sheets that turn rooms into ovens ? I would invite students to study a rich building tradition from a variety of angles and using all the tools at their disposal, including BIM. My cousin lived in Kathmandu some years ago and I took the opportunity to pay a visit. This was early on in my personal BIM journey and the models I started to make when I got back have been sitting around half-completed for several years now. 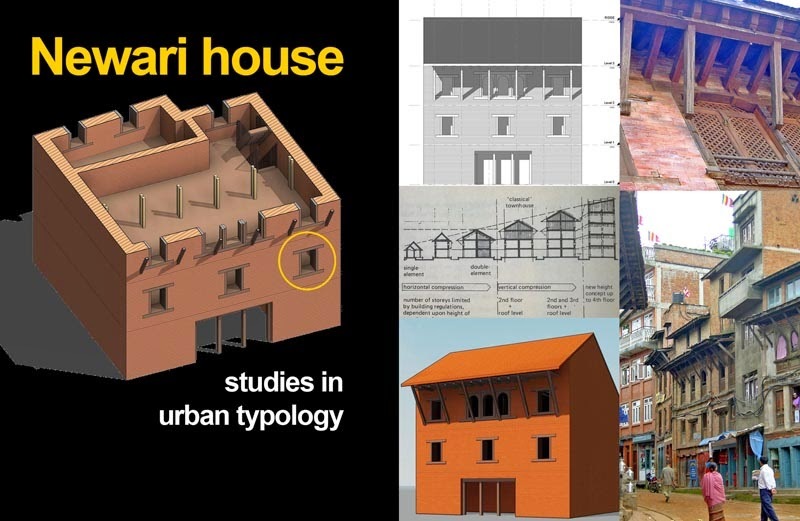 Urban design crops up in most architecture courses. Cities are the context for most of our work and we need to think deeply about how they work, and why they sometimes don't work. 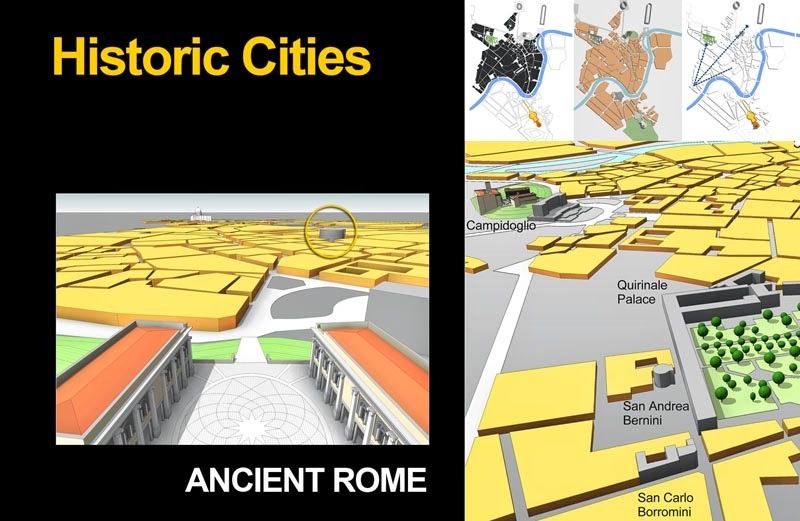 I have never been to Rome, but my BIM pencil has helped me to explore its rich and varied history in ways that no other learning aid could possibly rival. You could make a physical model, but that would take 10 times as long, and where would you put it ? You could use a generic modelling programme, and miss out on all the embedded data and true orthographics that BIM has to offer. I'll finish with this shot from my own recent design work. The Desert Pumpkin. 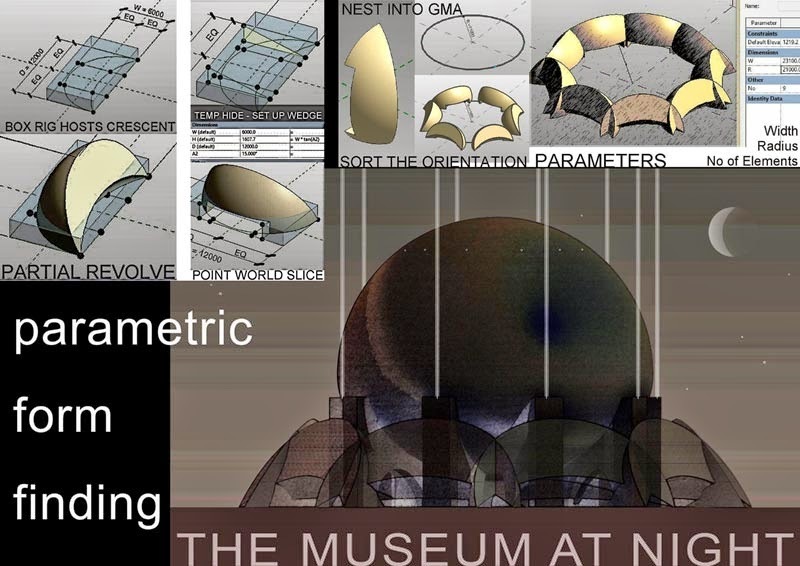 It's an imaginary project and an attempt to showcase the potential of parametric processes to generate and develop design concepts. It's the kind of thing that architecture students could be doing for their thesis projects. So please, don't make BIM into a course. Don't make a long list of topics and then subject your students to a series of lectures. Bad idea people. We need an integrated approach. Create opportunities, set challenges, encourage your students to make the BIM pencil a regular feature of their problem-solving tool kit. 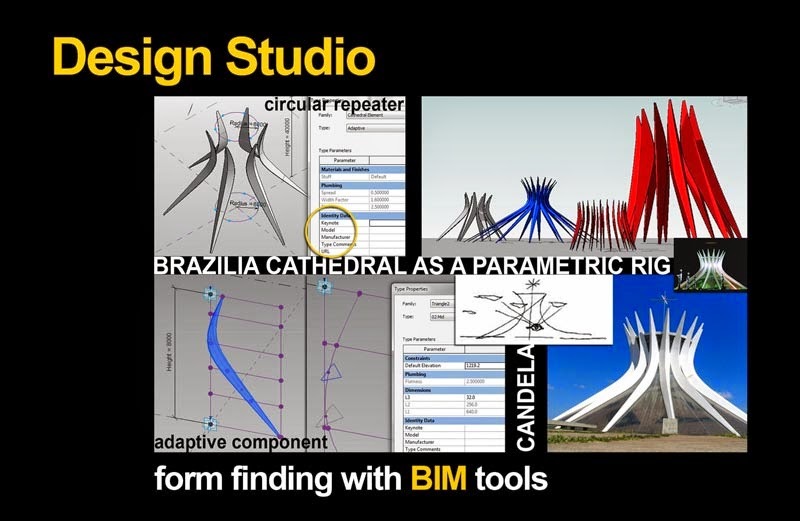 Let them use BIM for research, for design, for theoretical studies, for analysis. Seriously. Don't use aversion therapy. We need all the BIM addicts we can get. OK, this is a first for me. I've never used Revit Server, nor has anyone in our office ... until now. We suddenly find ourselves needing to do some work jointly with our UK office and have managed to get things basically working. It's not a hugely demanding situation, but the connection speeds are not that great, and it takes a LONG time to open the file in the morning. After that it gets better, but crashing is not too much fun. Share your experience, point me to a link. It's a genuine question. We are stumbling into new territory. Trying to get some input from our local reseller also, but it seems they also don't have much experience in this area. No pictures, shock horror ! The humble louvre, whether fixed or as a door, is a necessary evil in our designs. I blame the engineers. Seriously though, they are a classic case for the consideration of 2D v 3D. What level of detail should we model? My standard approach is to use a material which includes horizontal lines as a fill pattern. 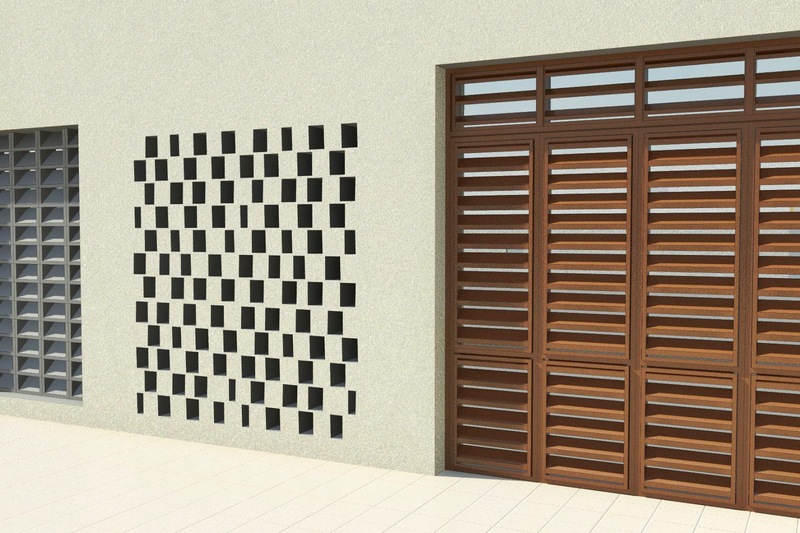 This allows a single door family to serve for louvres, glazed aluminium or panelled wood. It's lightweight and flexible, and via a bump map can even do tolerable service in rendered views ... from a distance. Recently I had to represent a variety of louvre types in a set of design proposals. I have a family that I've used for several years that uses an array of rectangular slats in a rectangular frame, so I decided to adapt this. I should explain that architects with "modern" sensibilities tend to prefer the purity of rectangular slats for screens that proviced a measure of privacy sun protection. The slats in this family are a nested component with linked parameters (Width, Height & Length) So all I had to do was to modify the cross-section of this family. My first attempts, I must admit were quickly cobbled together and required some trial and error when adjusting the parameters. But they did the job at the time. On reflection I came up with a plan for a louvre-slat with user-friendly parameters. Nothing spectacular here, but I thought it was worth sharing. 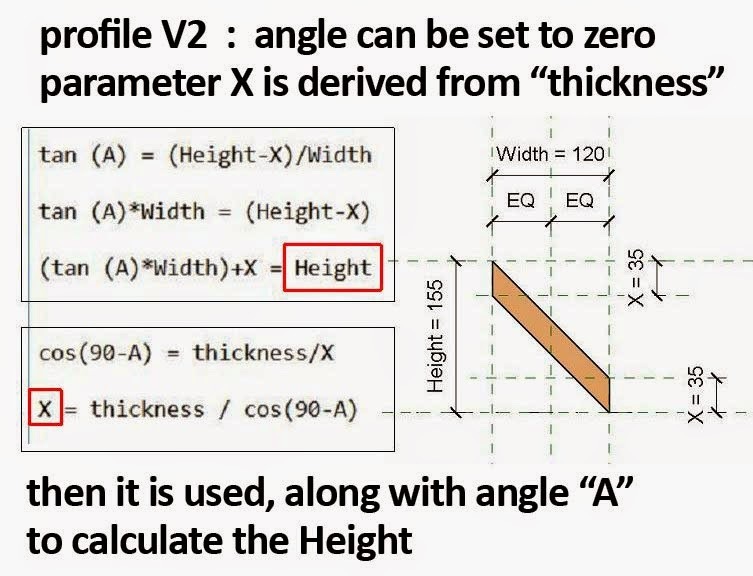 We already have width & height parameters inherited from the rectangular slat. The first thing I did was to add a diagonal in the form of a Reference Line. The great thing about Reference Lines is that (unlike planes) they have ENDS which can be locked in place. Just use ALIGN as you normally would when locking a line to a reference plane, then TAB through the possible selections until the end highlights. The thickness of the louvre is then set out using the diagonal as a centre. Load this back into the original screen family and it works fairly well: lots of parametric control and quite convincing, even from close up. At first I was happy to use the existing Height parameter to control the angle of the louvre, but eventually I decided that an Angle parameter would be simpler to use. This requires a bit of trigonometry. 50 years ago I learned the simple mnemonic "Tommy on a ship of his caught a Herring" Evidence to the curious workings of the human mind that this has stayed with me ever since. There have been times when many years past without me ever thinking of it, but when the need arises I can recall it instantly. So now I have a slat component with 4 "user input" parameters and 2 calculated values that I tuck away under "Other". In practice of course the user input values are driven by parameters in the screen family that the slat lives inside. Hook everything up and we have a pretty flexible set-up. It can look like a series of shelves, or louvred glazing, or an AC vent. I've organised the parameters in groups to make it as user-friendly as possible. There's only one thing missing really and thats a "Spacing" parameter to be used in the formula that calculates the number of slats. I got an error with this that's been puzzling me for some time. The message threw me off by talking about importing the correct table. Eventually I realised that I had 3 types in the family and at least 1 of them had a zero value for "Spacing". That would generate an infinite number of slats, hence the error message. If only the message mentioned a zero value instead of asking me to change the formula or import a non-existent table. Anyway, it won't catch me out next time. So that's it. Finishing with another rendered view of some of the families I made and pointing you to a link where you can download the basic screen family. Hope you find it useful.